IS:335/1993; ASTM D2440;D4636; D4871; D5763; D5846; IP 48; IP 154; IP 280; IP 306; IP 307; IP 331 (obs); IP 335; EN 61125A, B and C; IEC 61125 Methods A, B and C; BS 2000 Parts 48, 280 and 306; ISO 2160; ISO 7624; DIN 51811; NF T60-150; JIS K2513 with suitable change of flow meters of the appropriate flow rate and other small changes. Consists of a solid aluminum block bath to accommodate 4/6/12/24 test vessels. with Digital Micro Processor based Temp control with pt-100 sensor. Operation on 230 V, 50Hz., Single phase, AC Mains. Bath temp. Range 50°C to 375°C.,Accuracy + 0.1 C.
A. Automatic control of air/oxygen flow rate with digital display. B. Automatic “TAMPER PROOF” Data recording with recording of flow, temperature,time and faults during testing. D. Password protection for system settings. E. Internet/Lan/PC connectivity for seamless operation and monitoring from any where in the world. 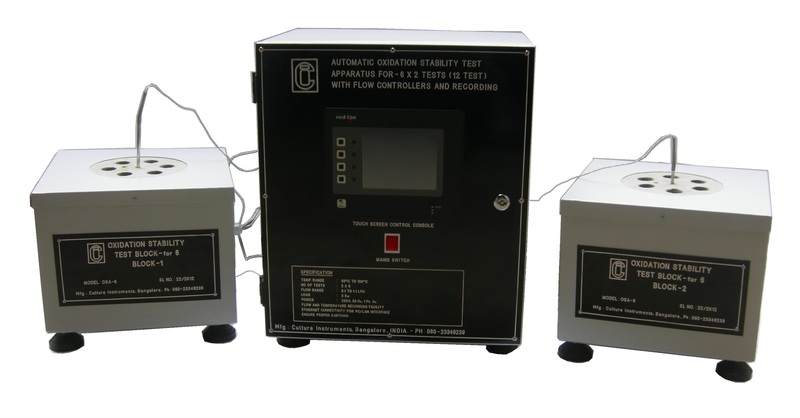 G. Selectable Test Gas Air/Oxygen.